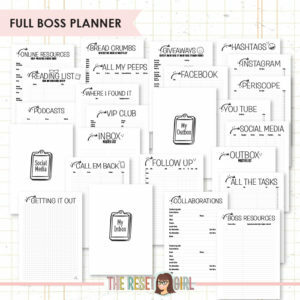 This insert collection was designed with the entrepreneur, blogger and/or girl boss in mind. 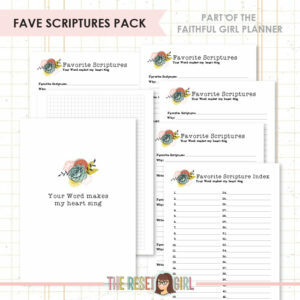 This pack is the heart of the planner and was designed for weekly and monthly planning. 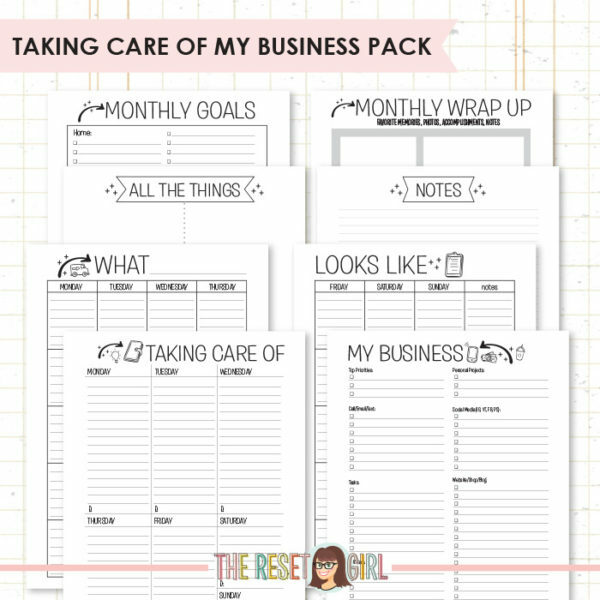 Taking Care of My Business: These UNDATED sheets are for WEEKLY planning and have a unique layout we think you will love. The right side is called the Master Planner page and is where you will record all your tasks, appointments and priorities on the right page for a high-level overview of your week’s activities, which also allows you to “batch” like activities together. 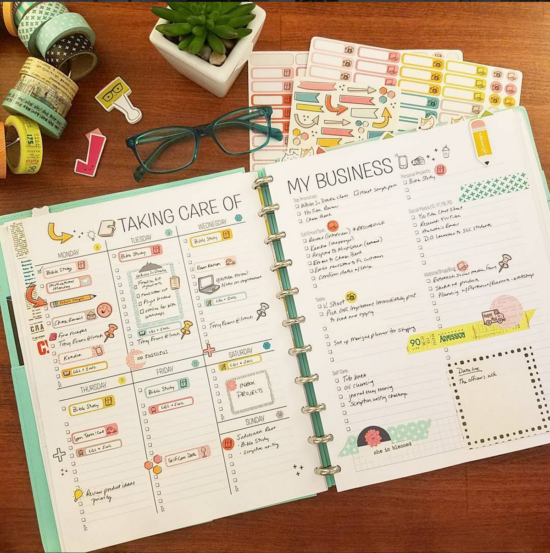 When you finish, begin assigning those tasks, errands, and appointments into blocks of time throughout your week on the left page, called the Weekly Planner. 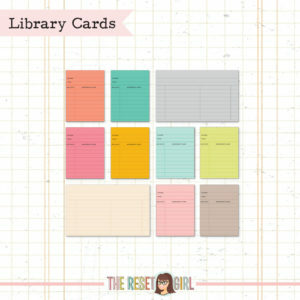 This will keep similar tasks together, like taking care of your social media work on a Tuesday afternoon, or doing all of your errands on a Friday, or outlining your blog posts for the week on Mondays. etc. Keeping a high-level view of ALL your tasks in one place gives you the best opportunity to plan how you will accomplish them throughout the week. The column format gives you ample space for creating task lists you can easily check off as you complete them. What ____ Looks Like: These UNDATED sheets are for MONTHLY planning and allow you to use them as needed, anytime during the year. Simply fill in the month name and dates, and then important, high-level information. Lined boxes make for creating neat lists if needed. 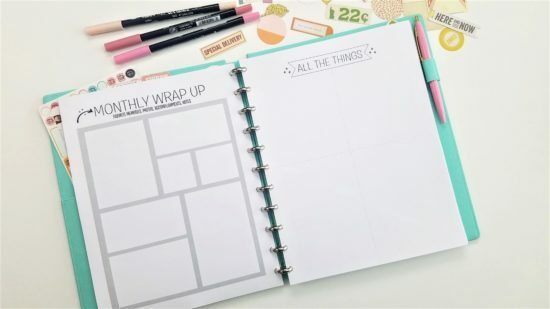 Monthly Goals/Monthly Wrap Up: Kick off your month by recording your goals for the next 30 days, in areas of your life including business, personal and home. Create and track a new habit by utilizing the 30-day habit tracker, and be sure to reward yourself if you complete each day during the month. 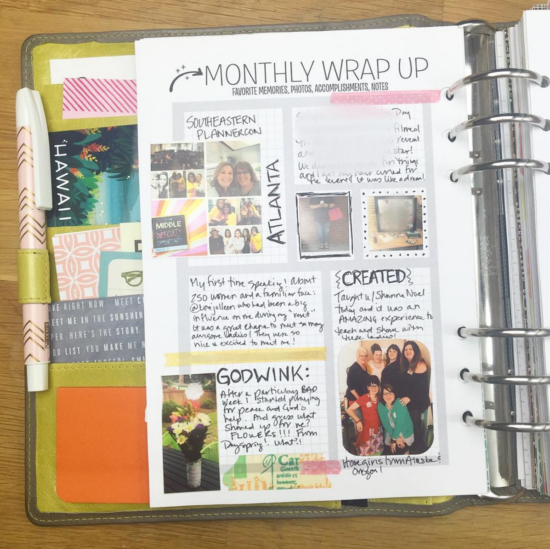 The Monthly Wrap Up allows you to do some simple memory keeping during the month, adding notes, photos from your pocket printer, and journaling. Look back on how you did in your business and life by recording some highlights on this page. All the Things: Consider this page a semi-organized brain dump. Use each quadrant for a certain area of your business like social media, blogging, clients, content, products, etc. and then let the ideas fly. 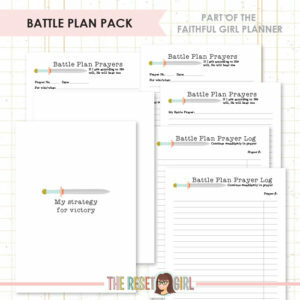 Jot down any and all thoughts that come to mind during your planning sessions or brain storms here. Transfer any actionable ideas to your weekly list of tasks.